A delicious 3 berry smoothie packed with antioxidants and vitamins for a healthy and delicious start to anyone’s day. My house succumbed to the flu. We had a good run. We’ve managed to avoid the billions of local germs floating around for last 6 months or so. But when it finally got us we got a doozy of a cold. Runny nose, sore throat, fever…achy joints, the works. I get a little nuts when I get sick. Least favorite thing to be! I looked up tricks to try to help kick the sickness fast. You know, Hot toddy’s (didn’t do much but make me sleep. Which wasn’t bad…), salt water gargles(sort of gross but helped the throat a bit). I even stood in the steamy bathroom (which is warm and steamy…but not a good cold remedy), hoping for a miracle cure I guess. Alas on day 4 of the cold we are still sick. I hate this! NEW Strategy! Making a smoothie full of immune boosting antioxidants fights against all things flu and cold. This at least makes more sense. If it doesn’t cure the cold it will help us rebuild our bodies. 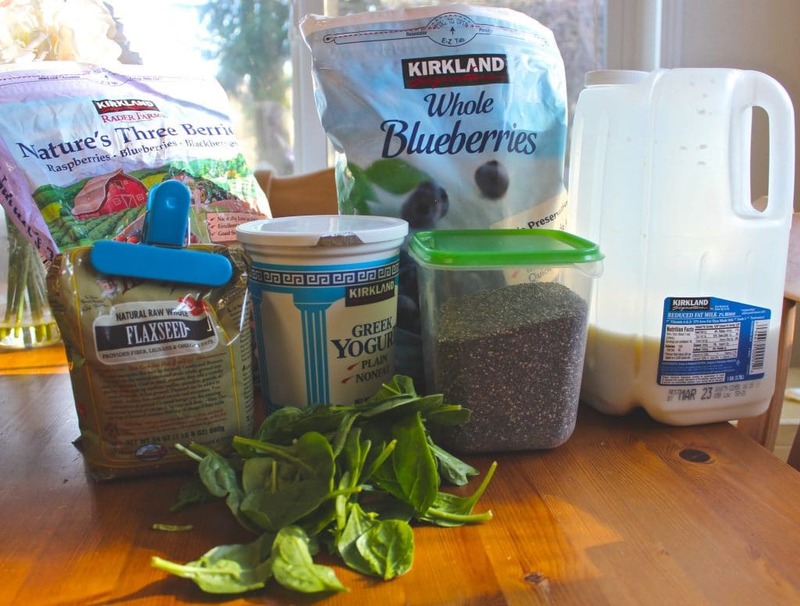 I created this yummy, comforting berry smoothie this morning and drowned my sorrows. I added a bowl of steel cut oats on the side to get the power house going. I’m a big baby when I’m sick. I’ll admit it. I feel very sorry for myself as I drag myself around the house all day. I have hopes that my berry smoothie will get me back on my feet in no time. WHY? BERRIES, FLAX and CHIA SEEDS! Our healthy Blackberry smoothie is also a powerful kick of nutrients. Watch us make it in the video. We really love blackberries. They grow VERY well around here and are very versatile. 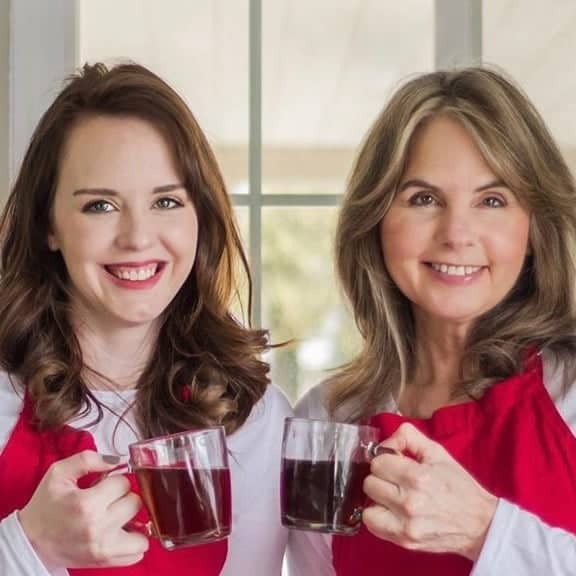 We have many recipes on this blog using up our abundant supply of this wonderful gift of creation. All Berries are amazingly good for you. This recipe is a triangulation of three TOP healthy berries. Blueberries, Blackberries and Raspberries. And they are delicious. So if it doesn’t knock out the cold at least I’ll enjoy a beautiful tasty comforting smoothie for breakfast. In general, According to WEB MD ALL berries are FULL of great antioxidants and many other beneficial nutrients. ALSO, berries fight inflammation which is fantastic for helping get the body back on the right track when fighting a cold. Additionally berries are rich in fiber and help keep the blood sugar and cholesterol levels regulated too. So put berries in your diet! Smoothies are a great way to do that. Berries are naturally sweet so no added sugars are necessary either. Looking for more smoothies? We have LOTS of delicious healthy smoothie recipes in our smoothie section. I’m breastfeeding my 3 month old daughter and the spinach, flax and chia boost the milk supply so I always toss them in. I also like to use milk and yogurt to get a little extra protein added into the smoothie. Looking to lower your carbs? Try using heavy cream in place of the yogurt and milk! This post was originally created March of 2016. A delicious 3 berry smoothie packed with antioxidants and vitamins for a healthy and delicious start to anyone's day. Blend all ingredients in a blender until smooth and perfectly blended. If the mixture is too thick, add in some more milk or yogurt. If the smoothie is too thin for your liking add in extra frozen berries. 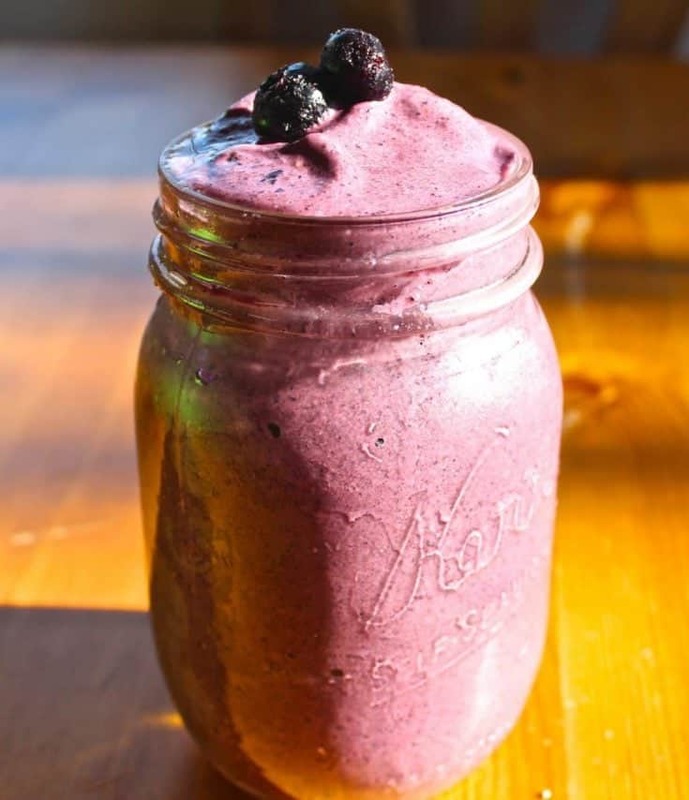 The frozen berries are what adds thickness and density to the smoothie. If you use fresh berries it will change the consistency of the smoothie a lot. To lower carbs replace the milk and yogurt with heavy cream. This may change the consistency of the smoothie somewhat. Yum yum yum yum!!! This looks so great! Thanks for sharing this at Totally Terrific Tuesday! Pinning!